Display your stems in rustic style above a tasting table, kitchen island or wine bar. Holds up to 24 stems (depending on size) & 8 bottles on top. Made of heavy-gauge metal with a powder coat to protect against rust. Securely suspends from steel chains. Must be mounted in studs/beams. What are the dimensions from hook to hook? I want to see if it will measure up to my beams and still be centered above my wet bar? How long are the chains? BEST ANSWER: The chains are about two feet long. Between the chain and the S hook that it comes with I believe they would work for up to a ten foot ceiling height. I am sorry that I can not provide an exact measurement of the chain because I removed a section of the chain when I hung the rack. I have 8 foot ceilings. The sections are easy to adjust in length if you have two sets of pliers, or a plier and a vice grip, or similar tools. I'm not in the store right now ... however, they come with some pretty long chains, as I remember, and we are using about a foot and to 15 inches. Hope that helps! I have not hung yet. I will measure chains for you tonight when I get home and advise tomorrow. About 14 inches. I'm not looking at them, and I don't use them, but that's approximate. The workmanship is great. I installed it at my mountain house. I will be back there next week & will answer then. I think I shortened them...in the picture they appear to be much longer. Can this be mounted inside a cabinet? BEST ANSWER: I believe it would work with considerable cabinet modification. The ceiling in your cabinet would need to be reinforced to withstand the weight of the full wine bottles. I believe the chains can be shortened a bit, but the cabinet would still need to be open enough to accommodate the height of the rack w/bottles on top and glasses hanging down. I am actually installing it underneath a shorter cabinet that comes down only 18" from the ceiling. I had my cabinet maker reinforce the bottom of my cabinet for the potential full weight. I don't see why not. The only thing might be that it sill swing a bit being on a chain. However, we didn't want swing and put the chains straight up which makes them much more stable. We really like them and they are well built as well. Hope that helps! Certainly. As long as you have sufficient clearance all around the rack and the strength on the cabinet to attach the mounting bolts for the chains The chains can be shortened for your specific cabinet as well. Yes. Remove the chain and anchor to the surface. Please be sure to secure well due to the weight. That's exactly what I did. Made hooks from eye bolts. BEST ANSWER: Chains are approximately 18 inches long. Very adjustable. I overlapped mine when I hung it. I have an island with a rack, where the wine rack fit perfectly! i have a 7 foot ceiling above my wet bar, can i mount this on the ceiling without the wires? I don't need the space for the bottles. BEST ANSWER: The constructors did for me. From floor to ceiling of my house is 7feet, i still mount with wire, it look nicer than without wires. You can adjust wire is shorter. You would still need to mounted to the ceiling you would need to put the chain inEnter an answer to this question. Hi how much would it cost to ship the $59.95 Metal Hanging Wine Glass Rack to Dunedin 9013 New Zealand? Hi, thanks I just went on that but shipping turned out triple the price of the product. Sounds a bit crazy haha. Any other options? What size hooks do I need to hang it? 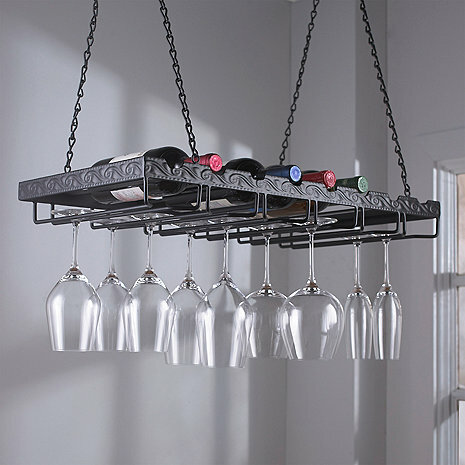 BEST ANSWER: The Metal Hanging Wine Glass Rack comes with 4 S hooks which you can use to hang the rack onto eye hooks or you can use your own. I used decorative hooks for house plants bought at your local hardware store. How many ceiling hooks to do I need to buy? 2 or 4? It's hard to tell in the picture, thanks. Does this rack hold the large wine bottles? If so how many? Yes this will hold appx 4 larger bottles. Do you ship to England ? How large are the openings for the wine glasses? I have some wine glasses with very large bases (about 3.25 inches in diameter) and won't fit most wine racks. BEST ANSWER: Hi Karly, openinings are about 3 1/4" flat, but my large ones fit if I angle the glass when hanging it. Once in the gate, oversize fits fine. If angled, might make fit 3 1/2" inches. Nice looking when hung! How much does it weigh ? How long does it hang and does hardware/bolts come with it ? BEST ANSWER: Hi, overall weight is around 5-8 pounds. The chains are about 16" long, but I shortened them based on my low ceilings. I used only two hooks to hang mine, which took about 20 minutes. Important to find ceiling joists, as when you load wine Into it, it becomes much heavier. I don't recall if it came with hanging hardware, but I chose to use decorative ceiling hooks instead. Is it possible you would be willing to ship the rack to the UK..? BEST ANSWER: I think that Wine Enthusiast could ship to UK. how long is shipping to canada? Can I get this in Antique Bronze or rust color? BEST ANSWER: This metal hanging glass rack comes only as shown. why are there no hooks included for the ceiling. BEST ANSWER: We don't include hooks as we tend to find that clients tend to prefer to choose their own based on the look, style and finish of their home. Are the chains adjustable? How are they attached to the ceiling? BEST ANSWER: You will have to mount the chains to a stud or beam in the ceiling and you will need to provide the hooks to do so. You can hang the racks on any of the links in the chain so in essence yes you can adjust. Are there any top views of this product? I am shorter than most people, so i will have to hang it lower, but want to see how it looks from above! BEST ANSWER: Although we do not have a photo of the top ,with 8 bottles displayed on this metal rack from the top ,I would think it is a really beautiful view . At this time is cannot be made to custom dimensions. Sorry. What is the length of the chains? this is a very useful piece for wine glasses and bottles of wine...my mistake was that i did not take into account the height of the ceiling....you need a space where the wine glasses are not hanging at eye level or too low...other than this issue it would have been a great practical solution for me. Prompt delivery, easy installation, nice capacity, and very attractive. Great quality at an attractive pruce. Fully 5 stars. It is nicer than I expected. It is a sturdy piece and matches my décor perfect. It is very attractive, sturdy and useful. The rack looks great and the glasses are easy to get in and out. It also holds all sizes! I love, love, love my stem and wine holder! Has plenty of chain and my husband had no trouble hanging it at all. Color also perfect and true to picture. Bought three of these wine racks for our Lodge bar and they are beautiful and very well made. We have limited storage so these racks fit the bill perfectly. Also received the wine racks in a timely fashion. Thank you for the great addition to our Lodge! Excellent house warming gift choice! This was a very nice set up with good construction and attention to detail. It looks elegant, yet it is very functional. I gave this to my daughter and she loved it! We bought this a while back. We took off the chains and mounted it on our large bakers rack. Matched perfect. My wine glasses look beautiful hanging off it. Friends think I bought the shelf like that. Well with the price. I purchased 2 of these racks for my bar. I have a vaulted ceiling which is pretty tall, so the provided chains were not long enough. I purchased some vinyl coated 1/16 inch stranded cable from amazon which is rated to hold more than the provided chains and it worked great. The racks are attractive and being able to store wine bottles on the top is a bonus. We mounted this at first with the included chains, but found it swayed too much. This was inside a niche, and we instead mounted it on steel rods from the sides, and it looked great like that (I may need to cut off the chain loops but waiting to make sure my boss does not change her mind). The hardware is well constructed, good solid welds, power coating is nice and thick. The actual stem hangers are a little strange - the ones on the right closer together than the left, but not by a lot (but enough some of our glasses only fit on the left). Overall a very nice rack. My wife is so in love with the metal hanging wine rack. It is an excellent fit for our room. Highly recommended. Easy to install and the storage for both bottles and glasses is nice. The glass rack fits perfectly where it was intended to go and the price was right. It completed our new solid black walnut bar. This is sturdy and beautiful. When I ordered it I thought it was stainless steel colored but it is black. Even better. Our contractor hung it for us, we are not using it for bottles and glasses...just glasses. It holds 24 glasses. We love it! Great large capacity wine/glass storage rack that looks great and was easy to install. Well made metal wine rack. Looks beautiful over our breakfast bar and goes well with our decor! We bought two for our new restaurant, to hang over our bar. They are absolutely beautiful and perfect for holding glassware of varied sizes. I love this rack. I bought 2 of them to fill up some empty space over my wet bar. They look great! I don't put wine bottles on top as I have a wine cooler. Well made product would definitely buy another if I had a place to put it. We found it easy to install and it works well for us. Some glasses won't fit but for the most part it is very good looking and does the job. I love love love my new wine rack. It looks amazing in front of the window hanging over my side boy. Did I mention I LOVE it? I bought 2 of these and put them side by side in my bar. They look amazing and for the price, the quality is great. They are heavy duty, and it looks elegant. I've deducting 1 star as the chains were slightly different lengths and there were no mounting devices. We had to shorten the chains as we only have 8 ft ceilings and while doing that we were able to fix the chain lengths. I'd buy these again. I like my wine rack very much. It fits perfectly in my small apartment and it has a lot of character. My only complaint is that I don't have tall ceilings, so I had to remove some of the links in the chain and that was kind of hard.... I wished the main hooks were easier to move to the length needed.